After the victory at Magnesia, Scipio Africanus dictates harsh peace terms to the Seleucid envoys. 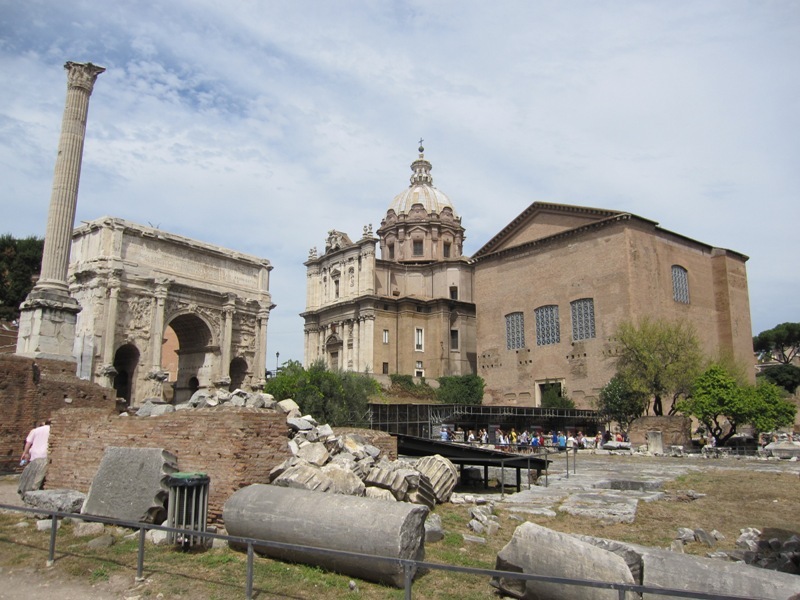 At the beginning of the year, Rome was bristling with diplomatic activity. First, a Macedonian delegation was welcomed by the Senate. Even though relations with King Philippos were a bit sour because of what had happened at Lamia the previous year, the welcome was cordial and the Senate decided to release Demetrios, the king’s son, who had been held in Rome as a hostage for over six years. In addition, the king’s obligation to pay an annual tribute to the Romans (as part of the indemnity agreed after the Second Macedonian War) was cancelled. The Senate also decided to release the Spartan hostages that had been sent by the tyrant Nabis (now long dead), but for some reason they refused to release Nabis’ son Armenas. The latter soon fell ill and died. Then an Aetolian delegation was admitted to the Senate. The senators were not inclined to show any mercy and made the envoys choose between an unconditional surrender (deditio) or a fine of 1.000 talents. The first option was clearly unacceptable, as the senators refused to tell the Aetolians how they would be treated after the surrender. The second option amounted to extortion and was unacceptable too. No peace was made therefore, the war between Rome and the Aetolian League would continue. Envoys from the King and Queen of Egypt were also received by the senators. They congratulated the Romans on their victories over King Antiochos and encouraged them to cross over to Asia Minor to finish the war there. The envoys’ words were a bit ironic, as Queen Cleopatra was actually Antiochos’ daughter and her husband King Ptolemaios V therefore his son-in-law. But Egypt was a firm Roman ally. Scipio Africanus had good reason to be proud this year. His younger brother Lucius Cornelius Scipio and his good friend Gaius Laelius had been elected consul. It was decided that the issue of the provinces would not be decided by lot, but by a debate in the Senate. Both consuls were eager to be sent to Asia to fight Antiochos, but when Scipio Africanus promised that he would accompany his brother as a legate if the war against the Seleucid king was granted to Lucius, the issue was quickly decided. Laelius would stay behind in Italy and would see little action. He spent most of his time repopulating the Latin colonies of Placentia and Cremona, which were still struggling deep inside hostile territory. 6.000 families were recruited and moved to the north. Laelius also proposed to found two new Latin colonies in the territory that had been taken from the defeated Boii the previous year. One of these would be founded the next year and would become a famous city: Bononia, present-day Bologna. Laelius presided over the consular elections of this year as well. 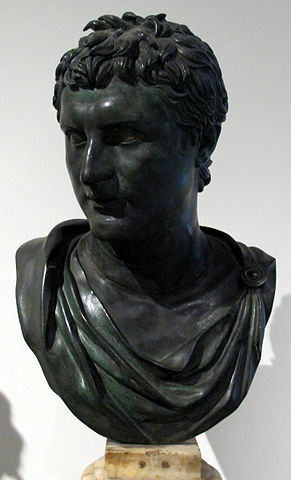 In the first round, only Marcus Fulvius Nobilior managed to win an absolute majority of the 197 centuriae. In the second round, the comitia centuriata elected Gnaeus Manlius Vulso as Nobilior’s colleague for the next year. Manius Acilius Glabrio, the victor of Thermopylae, returned to Rome at the end of this year and asked the Senate for a triumph. He had sent ahead 43 important Aetolian prisoners, among them Damokritos, the Aetolian who had dared to insult Titus Quinctius Flamininus. These men were thrown into the Lautumiae, a dungeon in a former stone quarry on the Capitoline Hill. The Senate decided to grant Glabrio’s request for a triumph, but Damokritos managed to escape before he could be paraded in the ceremony. The prison guards caught up with him on the banks of the Tiber, the very same banks where Damokritos had wanted to present Flamininus with a copy of the Aetolian invitation to King Antiochos to liberate Greece. Here the Aetolian killed himself. Glabrio presumably did not shed any tears over Damokritos’ absence. His triumph was spectacular anyway, but it would get him into trouble the next year. 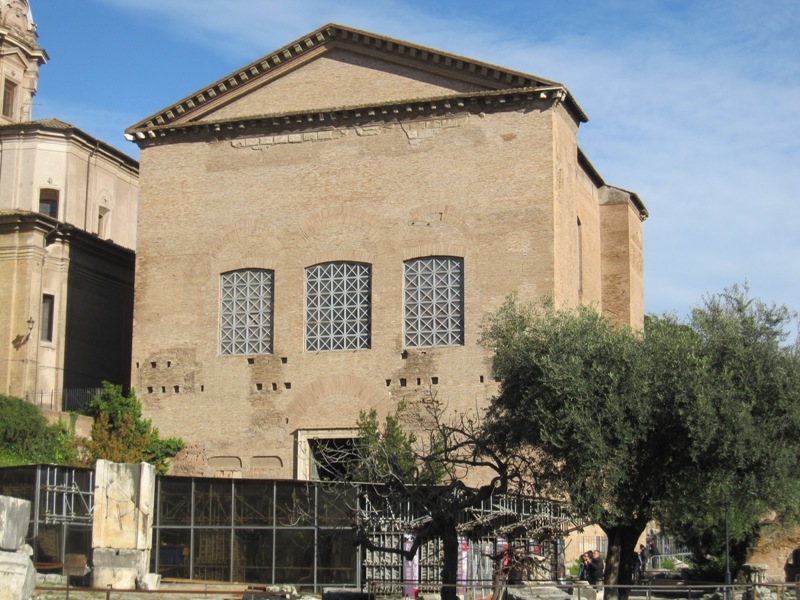 The Senate House – Curia – on the Forum Romanum. Quintus Minucius Thermus had also returned to Rome from his campaigns against the Ligurians. He too pressed for a triumph, claiming that he had fully pacified the tribes. Thermus, however, faced staunch opposition from Marcus Porcius Cato. Cato, now in his mid-forties, was an excellent orator. In his speech De falsis pugnis, he argued that the proconsul had simply made up battles and victories. In another speech, Thermus was accused of having summarily executed Roman allies. Cato’s opposition proved to be very effective. The proconsul was denied a triumph. There was bad news from Spain this year. The propraetor of Hispania Ulterior, Lucius Aemilius Paullus, suffered a severe defeat against the Lusitani at a place called Lycon. 6.000 Romans were killed. The survivors just managed to cling on to their camp and had great difficulty getting back to friendly territory. Paullus survived and would have his revenge the next year. After the Aetolian delegation had failed in its mission to Rome, the war in Greece continued. The Roman commander Manius Acilius Glabrio – who was still in the region; the triumph mentioned above was later this year – searched for a new target to attack. Naupaktos was no longer an option, as the Aetolians had blocked a pass leading to the city. Rather than attempting to punch through there, Glabrio decided to attack Lamia. This was a clear-cut case of Roman opportunism, as that same Glabrio had prohibited the Macedonian king Philippos from taking the city the previous year. The proconsul believed the city to be an easy prey because it was still reeling from the Macedonian attack, but the citizens resisted his men fiercely and repulsed the first assault on their walls. The Romans renewed the attack the next day, and several hours later Lamia was taken and pillaged. 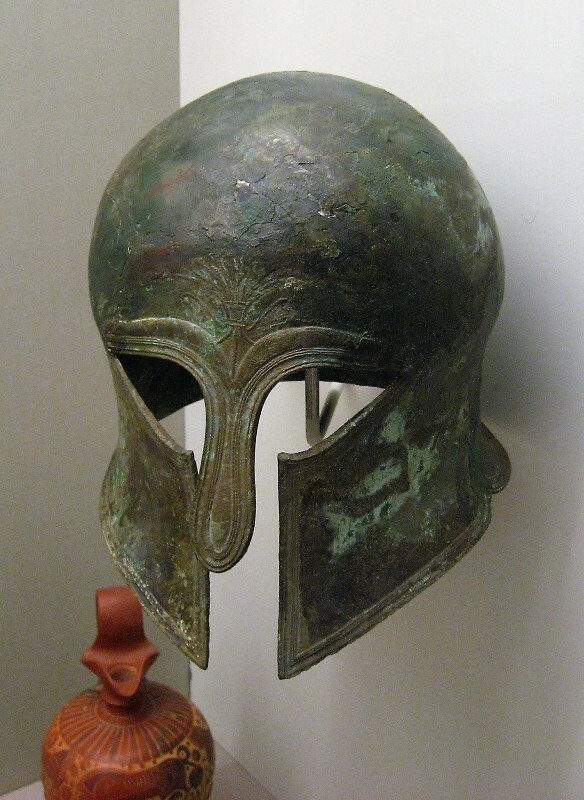 Corinthian Greek helmet (Allard Pierson Museum, Amsterdam). Glabrio’s next target was Amphissa in Phokis, which had been a member of the Aetolian League for sixty years. Here resistance was fierce as well, with the defenders frequently sallying to destroy the Roman siege equipment. The Romans nevertheless succeeded in bringing down parts of the wall, and Amphissa would probably have fallen, had not by this time the two Scipios arrived. The consul and his famous brother had left Brundisium in March and had landed at Apollonia with over 13.000 fresh troops, among them 5.000 volunteers who had previously fought under Africanus. They had already marched through Epirus and Thessaly and were now near the Malian Gulf. It was now May. The Scipios wanted to have their hands free for the war with Antiochos, so they ultimately granted the Aetolians a six-month armistice, which would last from early May to late October. The siege of Amphissa was raised and envoys from the Aetolian League were once again despatched to Rome. Their mission would end in utter failure several months later. The Senate was clearly fed up with the Aetolians, humiliated them and chased them out of the temple where the meeting was held. The envoys were told to leave Italy within 15 days. But these events still lay in the future when Glabrio was relieved of his command. He transferred his forces to the consul and sailed back to Italy, where he would ask the Senate for a triumph (see above). The Scipios now marched north again, to Macedonia and Thrace, as they wanted to invade Asia Minor by crossing the Hellespont. The road through Thrace was very dangerous, as various tribes in the region constantly preyed on travellers to rob them. They would be more than willing to attack an exposed Roman column if they had the chance. The Romans therefore needed and got aid from King Philippos, who escorted them all the way to the Thracian Chersonese (now Gallipoli), provided them with food and drink, and guarded their flank. When Lucius Scipio and his army finally landed in Asia Minor, a lot had already happened there. King Antiochos had done much to rebuild his army and fleet after last year’s defeats. Hannibal had been sent to Syria to get ships from the Phoenicians and Polyxenidas had been ordered to restore and re-equip ships that had survived the disastrous naval battle off Cape Korykos of the previous year. Leaving his son Seleukos in Aeolis to watch the coast, the king himself began recruiting fresh troops further inland, in Phrygia and Galatia. The Roman admiral Gaius Livius Salinator had in the meantime forced Sestos to surrender, which was an important city on the Thracian Chersonese. His next target was Abydos, which lay directly opposite Sestos. Antiochos had reason to celebrate when his admiral Polyxenidas – himself a Rhodian exile – annihilated the Rhodian fleet in the harbour of Panormos on Samos. The battle took place around the Spring equinox (so around 21 March), but it was hardly a battle. When the Rhodians tried to escape from the harbour, they were attacked from all sides. Their admiral Pausistratos was killed and only five Rhodian ships and two from Kos managed to get away. The Rhodians had a new weapon on some of their ships, a “fire basket” suspended from a long pole, that could be used to deposit combustible material onto enemy ships and set them ablaze. The device would work well in later battles, but here at Samos it proved to be useless. Not long after the battle, Seleukos managed to capture Phokaia, the metropolis of Massilia, Rome’s ally in Southern Gaul. King Eumenes II of Pergamum (photo: Sailko; CC BY 3.0 license). The defeat of the Rhodians had serious consequences. Gaius Livius Salinator now feared an attack by Polyxenidas on his own fleet, which was fairly small. He therefore gave up the siege of Abydos, even though its garrison was close to surrender. In May or June, Livius met with his successor on Samos and transferred command of the fleet to him. 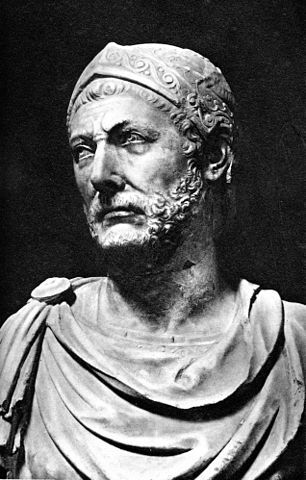 This successor was Lucius Aemilius Regillus. Regillus also met with King Eumenes of Pergamum and with Eudamos, the new admiral of the Rhodians. He then received a letter from Lucius Scipio, informing him of the armistice with the Aetolians and of the consul’s march to the Hellespont. Regillus decided to make use of his experienced predecessor Livius one more time and sent him to Lykia for further operations, but these achieved little. Regillus’ own operations were not very successful either. In the meantime, Seleukos had invaded the territories of Pergamum. The king’s son marched straight for the capital itself, which was defended by Attalos, King Eumenes’ younger brother. Attalos realised his forces were too weak to confront those of Seleukos in open battle and withdrew behind the walls of Pergamum. Seleukos was soon joined by his father with fresh levies, but King Eumenes also returned and the Romans and Rhodians – the latter with a fresh fleet – were on their way too. 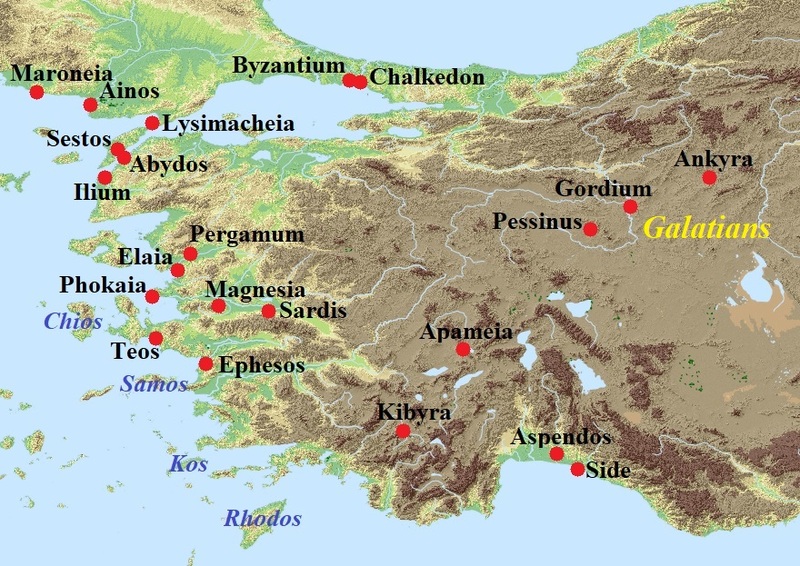 All of them landed at Elaia, the port of Pergamum. Antiochos then decided to march to this city, taking his entire army with him. The king deployed his infantry on a hill, making sure the Romans and their allies could see them. He subsequently took all of his cavalry – more than 6.000 men according to Polybius – to the walls of the city and sent a herald to Regillus, who declared that the king was ready to negotiate about peace. The praetor consulted his allies, and the Rhodians stated that they were prepared to make a deal with Antiochos. But King Eumenes convinced Regillus not to open negotiations until the consul Lucius Scipio, who outranked a praetor, had arrived. This decision was reported to Antiochos, who was furious and immediately began devastating the area surrounding Elaia. Meanwhile, a contingent of 1.000 Achaean hoplites and 100 horsemen, led by one Diophanes, had arrived in Elaia and managed to sneak into Pergamum during the night. Earlier this year, Pergamum and the Achaean League had concluded an alliance, and now the League sent the Pergamenians these veterans. These men proved to be worth their weight in gold. Making daring sorties, they managed to defeat forces that were far superior to them in numbers on more than one occasion. In the end, Seleukos was forced to evacuate his camp and break off the siege. The Battle of Side was the second of three large naval battles this year. The Rhodians had recovered well from their crushing defeat at Samos. A new fleet of 36 ships was anchored near the river Eurymedon when citizens from Aspendos reported that the Seleucid fleet was at nearby Side in Pamphylia. This was the fleet that Hannibal had been ordered to bring up from Syria and the famous Carthaginian himself commanded the left flank. The Seleucid fleet was larger, comprising 47 ships in total, but the Rhodian ships were of better quality and their crews more experienced than the Syrians and Phoenicians. The Rhodians quickly defeated the Seleucid right flank, which was commanded by a certain Apollonios. Hannibal managed to corner the Rhodian admiral Eudamos with his superior numbers, but the admiral was saved by the ships from his victorious left wing. Attacked from all sides, Hannibal gave up his flank and fled. The Rhodians wanted to give chase, but many of the rowers were under the weather and tired because they had previously camped on marshy terrain and had fallen ill. Part of the Seleucid fleet therefore managed to get away, for which the Rhodians bitterly reproached each other. Hannibal now disappears from our story. The Roman biographer Cornelius Nepos – not the most reliable source – claims that he first went to Crete, where he stayed in Gortys for a while. Later (ca. 188 BCE), he travelled to the court of King Prusias I of Bithynia, who gave him sanctuary. There he would live until he was finally hunted down by the Romans in 183 BCE. The third naval battle of this year took place not long after the Battle of Side. It was fought in September off Cape Myonnesos, west of Ephesos and not far from Cape Korykos, where the Romans had won a splendid victory the previous year. Prior to the Battle of Myonnesos, the Roman praetor Regillus had spotted fifteen ships sailing away from Chios. He believed these vessels to be Seleucid ships and decided to pursue them with his fleet and his Rhodian allies. However, the praetor soon realised they were in fact pirate ships that had just looted the coast of Chios. The pirates used light ships such as yachts and lemboi, which were much faster than the Roman ships. They got away easily and hid in the vicinity of Cape Myonnesos. 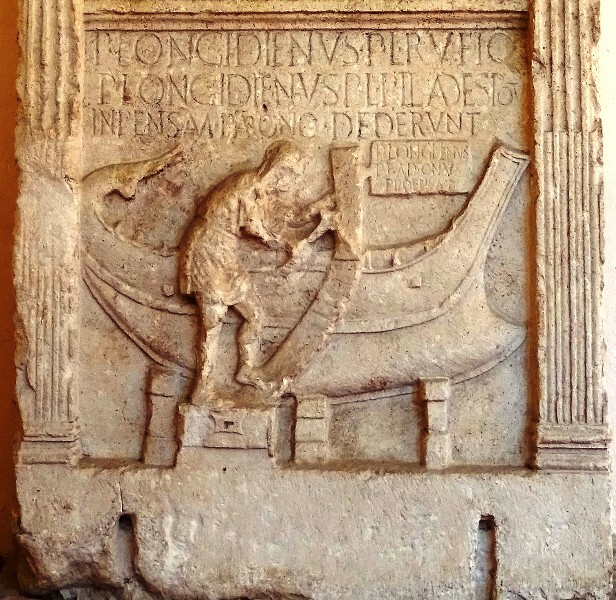 Roman ship on a tomb from Classe, near Ravenna (Archaeological Museum of Ravenna). Regillus was angry and decided to pillage the territories of the nearby city of Teos. Docking his ships in one of the two harbours of the city, the praetor accused the inhabitants of having aided the enemy by sending food and wine to the Seleucids. If they would provide the Romans with the same amount of provisions, he would spare the city. 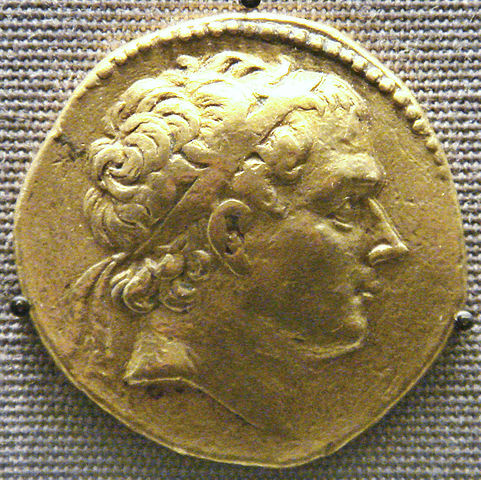 At about the same time, the Seleucid admiral Polyxenidas had arrived near Teos. He wanted to repeat the tactics that had led to his great victory at Samos earlier this year, but his attempt to blockade the Romans inside the harbour failed for a very simply reason: the Roman fleet was no longer there. When the citizens of Teos had decided to give the praetor what he wanted, Regillus had moved his fleet to the second harbour. When it was reported to him that an enemy fleet had been sighted, the praetor immediately took action. Working closely together with Eudamos, the Rhodian admiral, Regillus managed to get his ships and those of the Rhodians out of the harbour and deployed them in battle order. The two fleets were evenly matched: 58 Roman ships and 22 from Rhodes fought against 89 ships commanded by Polyxenidas. This time the Rhodian “fire basket” worked well, as the Seleucid crews were terrified of it. The Roman ships broke through the enemy line and then turned to rout the Seleucid left flank and centre. When Polyxenidas fled, the right flank collapsed as well. Seleucid losses were heavy: 29 ships were destroyed and a further 13 captured. The Romans lost just two ships and the Rhodians one. After the defeat at Myonnesos, King Antiochos seems to have panicked. He made a serious tactical blunder by withdrawing a Seleucid garrison from Lysimacheia in the Thracian Chersonese. The Romans would have had to capture this city before they could move further south towards the Hellespont and Lysimacheia’s garrison could have held out for months. This would have seriously delayed the Roman offensive, but now the city would be presented to the consul Scipio on a silver platter. The king did not care. He gave up all of his operations on the coast as well and withdrew to Sardis. The praetor Regillus meanwhile decided to follow up on his victory at sea by recapturing the city of Phokaia, which had been taken by the king’s son earlier this year. The praetor attacked the city from two sides, but the locals put up some furious resistance and forced his troops back. The Phokaians nevertheless chose to surrender when it was reported to them that Antiochos would not send any aid. When they opened their gates, things quickly got out of hand. Regillus expressly forbade his men to pillage, but they ignored him and started looting the city anyway. The praetor then personally protected the free citizens of Phokaia by having a herald call them all to the forum. Since winter was approaching, Regillus decided to stay in Phokaia. In the meantime, Lucius Scipio had marched past Maroneia and Ainos in Thrace without any problems, mainly thanks to the good services of King Philippos (see above). He now arrived at Lysimacheia, and to his surprise found it completely deserted. For some reason, the garrison had not even destroyed the supplies, which now fell into Roman hands. The consul quickly marched on to the Hellespont where King Eumenes had already made preparations for the crossing. The Romans then crossed into Asia Minor unopposed. They could have moved on immediately, but were delayed because of religious obligations. It was now March – or Mars – according to the Roman calendar (November according to ours), the time of a festival in honour of the war god Mars Gradivus. Even though the festival – which involved the ‘shaking’ of the twelve shields of Mars (ancilia) during a procession and war dance – was in Rome, travelling was prohibited for armies abroad as well, so the Romans chose to make camp and wait. 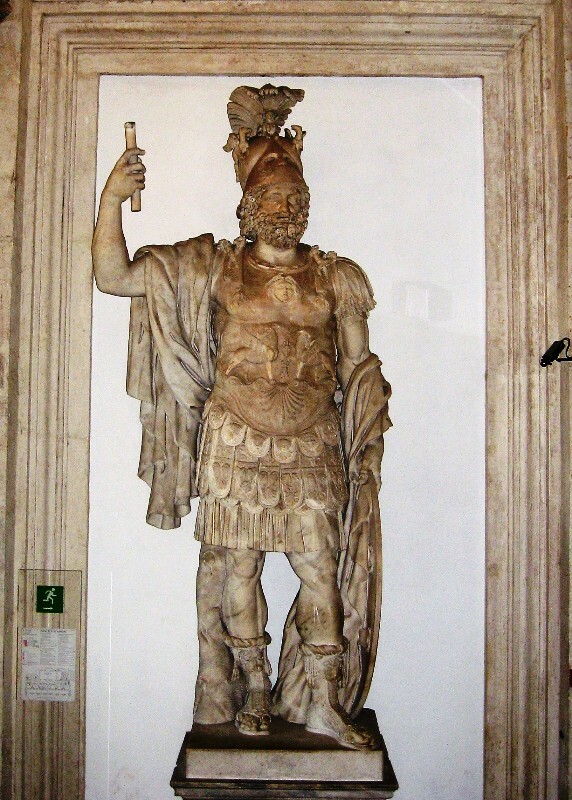 Imperial Roman statue, presumed to be the war god Mars (Capitoline Museums, Rome). Scipio Africanus had not made the crossing. He was a Salian priest – i.e. a ‘jumping’ priest of the aforementioned Mars Gradivus – and therefore subject to even stricter religious rules: he was not allowed to move from his current location for thirty days. It was in those days that Antiochos sent his envoy Herakleides to the Roman camp to negotiate. Herakleides had been given strict orders to only address the consul if his more famous brother was present as well. Even though Lucius Scipio formally commanded the Roman army, it was perfectly clear to all who was really in command. The envoy therefore waited until Africanus had arrived and then presented the Romans with the king’s proposal. Antiochos was willing to make a few concessions, give up his claim on territories in Europe, give up a few cities in Asia Minor and pay half of the Roman war costs. The Romans, however, demanded that the king evacuate all of Asia Minor west of the Taurus Mountains and pay all of the costs of the war. Clearly these negotiations were going nowhere. In a private conversation, Herakleides tried to make Scipio Africanus an offer he could not refuse. The Seleucids had somehow managed to capture Scipio’s youngest son Lucius. The circumstances of his capture are not clear. In one version of events, Lucius’ ship was captured while sailing near Euboea. In another, slightly more heroic (and therefore perhaps slightly more dubious) version, Africanus’ son had led a Roman scouting party in Asia Minor. When enemy horsemen approached, he had withdrawn, but had fallen from his horse. The Seleucids had then seized him, but treated him well, knowing full well that this was a valuable prisoner. Herakleides now offered Scipio to return his son to him and promised to give him large sums of money, both now and in the future. Scipio gratefully accepted the offer with regard to his son, refused the money and gave the king some solid advice: accept all the demands of the Romans and do not fight them. Not long after Herakleides had left, the Romans marched to Ilium, the site of ancient Troy. Since they claimed descendance from the Trojans, they halted here and the consul made a sacrifice to Minerva. Scipio Africanus then suddenly fell ill and was taken to Elaia. It was then that Antiochos returned his son to him. Although one can speculate about whether Scipio simulated his illness and left the Roman army to get his son back, there is no direct evidence for this theory. The former consul Gnaeus Domitius Ahenobarbus now acted as Lucius Scipio’s principal advisor, at least according to Appianus. Antiochos had in the meantime withdrawn to Magnesia on the Sipylos. The consul pursued and fought skirmishes with troops that the king sent against him. It was now December and winter was rapidly approaching. Both sides realised that a pitched battle had to be fought now. The stage was set for the Battle of Magnesia. 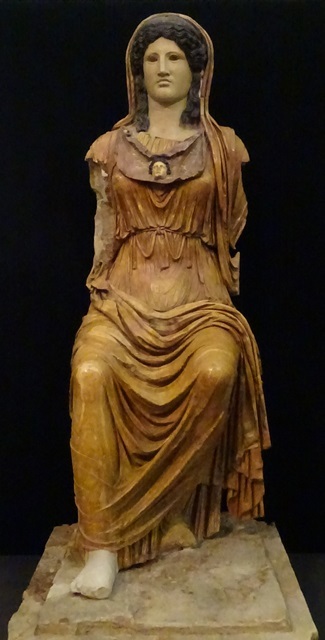 Polychrome statue of Minerva (1st century BCE; Museo Nazionale Romano). For a description of the battle, we have to rely on Livius’ account – who based it on lost chapters of Polybius’ work – and on Appianus’ Syrian Wars. The latter claims that the Roman army was about 30.000 men strong and this seems plausible. Livius mentions two Roman legions and two alae of Latins and allies. This was a standard consular army, but the legions and alae were larger than usual and comprised 5.400 men each. In addition to these 21.600 infantry there were about 3.000 Pergamenians and Achaeans on foot. 2.200 Roman and 800 Pergamenian cavalry were positioned on the right flank. Since the Roman left flank was positioned against the steep banks of the river, just four squadrons of cavalry were placed there, perhaps no more than 120 men. 1.000 Trallians and Cretans were positioned on the far right flank and 2.000 Macedonians and Thracians were left behind to guard the camp. The Romans also decided to keep their 16 elephants in reserve. These were African elephants, much smaller than the Indian elephants used by the Seleucids, of which there were 54. The Seleucid Empire was a huge multicultural empire and Antiochos had drawn troops from all corners of his vast realm. 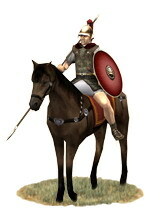 Livius claims the king had 60.000 infantry and 2.000 cavalry, but the number for the cavalry cannot be correct and elsewhere – see above – much higher numbers of horsemen are mentioned. Appianus states that Antiochos’ army was 70.000 men strong. Both agree that the core of the king’s army were the phalanx pikemen, of which there were 16.000. They were divided into ten huge blocks and deployed in squares with a frontage of 50 men and a depth of 32, which was deeper than was usual. On both sides of the phalanx there were Galatians, Cappadocians, men from Syria and the various regions of Asia Minor, Tarentines, Trallians, Cretans, Dahae horse archers, but also slingers from Media and archers from Elam. The king fielded cataphracts, an elite squadron of horsemen known as the agema, the Silver Shield royal guard (argyraspides), war elephants, dromedaries with Arab archers and finally scythed chariots. The numbers given for the Seleucid army may have been exaggerated by our sources, but it must certainly have been a very impressive force. It also seems plausible that the king’s army outnumbered that of the consul, perhaps by a large margin. But the consul commanded a veteran army, while many units in the king’s army had only recently been levied. The Seleucid army was furthermore basically a force composed of multiple smaller armies. It seems very unlikely that the individual units had any experience in marching and fighting together. In any case, no matter how impressive it looked, the Seleucid army would perform poorly. Roman horseman (eques) of a Republican legion (source: Europa Barbarorum). The battle started in the morning. It was damp and there was a heavy fog. Antiochos sent his scythed chariots against the Romans and their allies, but their charge failed miserably. King Eumenes quickly neutralised the chariots by having his missile troops pepper the horses with arrows, slingstones and javelins. The horses panicked and turned, causing the chariots to rout the dromedaries and charge into their own ranks, causing mayhem and slaughter everywhere. As the chariots ploughed through the Seleucid infantry, the Roman horse on the right charged the enemy cataphracts on the left wing. Cataphracts were almost unstoppable on the charge, but when stationary they were an easy prey. The Roman and Pergamenian cavalry drove many of them off the field and killed many others. The whole Seleucid left flank was now caving in. The Indian war elephants could do nothing to stop the rout. The Romans were by now used to fighting these monsters. They could usually be neutralised by pelting them with missiles from a distance or by getting up close and hamstringing them. The battle could have been decided then, but Antiochos had gained a success on the other flank. The king personally commanded the Seleucid cavalry on the right flank and had charged the Roman line spear in hand, just like Hellenistic kings were supposed to do. Even though the Romans were close to the river, the king’s cavalry managed to get around them and hit them in the flank. The Romans had positioned little cavalry here and could not counter the enemy charge with one of their own. The lines of infantry were routed and driven back to their camp. Fortunately, there were still 2.000 fresh Macedonian and Thracian reserves in that camp. A tribune led them out, rallied the fleeing soldiers, turned them around and confronted the king, whose cavalry had by now lost all formation. Then more help arrived, as Eumenes’ younger brother Attalos charged in with 200 horsemen from the right flank. This was all too much for Antiochos. Unable to put up any effective resistance, the king turned his horse, cut his way through Attalos’ troopers and fled with a handful of his men. Replica of a Roman gladius (left). The Romans had been victorious on both flanks and could now start to cut down the phalanx in the centre. The flanks and rear of the pikemen were no longer covered, and it was easy to attack them from all sides and pepper them with missiles from a distance. The phalangites nevertheless put up some determined resistance and the depth of their formation made sure they did not rout easily. However, many were hit by Roman pila or cut down by the Roman sword. Soon there were piles of bodies in the Seleucid centre, and in the end the pikemen were routed as well. The Roman cavalry mercilessly pursued the fleeing enemy, killing scores of them, and there was more carnage when the Romans stormed the king’s camp. Livius and Appianus claim that on that day, between 50.000 and 53.000 Seleucid soldiers were killed. Even if these numbers are inflated, which they likely are, the king’s losses were horrendous. Roman losses were comparatively light, but surely the numbers given by the aforementioned historians (between 339 and 349 men) are ludicrous. During the night, Antiochos first fled to Sardis and then to Apameia. Lucius Scipio quickly captured Sardis and its citadel. His brother Africanus had by now recovered from his disease and travelled to Sardis as well. Antiochos decided to send envoys to the consul to discuss peace terms. One of them was Zeuxis, who had been satrap of Lydia. The other was his nephew Antipatros. In the ensuing negotiations, Scipio Africanus once against played an important role. He basically dictated the peace terms to the envoys. The king was to stay away from Europe, evacuate all of Asia Minor west of the Taurus Mountains and pay an indemnity of 15.000 talents. 400 talents were to be paid to King Eumenes, and the Romans demanded 20 hostages, among them the king’s son Antiochos. The Romans also wanted Hannibal to be extradited to them, as well as some Greek troublemakers whom they held responsible for the war. These terms were harsh, but the envoys had instructions to accept everything without discussion. Zeuxis and Antipatros were sent to Rome to have the terms ratified by the Senate and People of Rome. The fighting was over, and the proud Seleucid Empire had been humiliated. Livius, Ab urbe condita, Book 36.35 and 36.45 and Book 37.1-37.49. See 191 BCE. The Aetolians had invited Antiochos to liberate Greece at a spring meeting of their League in 192 BCE. The city had been besieged and captured by Philippos of Macedonia in 200 BCE and then by Antiochos in 196 BCE. During the war between Rome and Antiochos, Prusias refused to side with the latter, even though he feared Roman expansion and Rome’s ally Pergamum was his sworn enemy (Polybius 21.11). The Greek term is κέλης, Livius 37.27 uses the Latin term celox. Livius 37.30. Appianus has slightly different numbers: 58 Roman ships, 25 Rhodian ships and 90 Seleucid ships. Livius 37.30. Appianus mentions 29 ships lost in total, including the 13 captured. Just south of Elaia. There was another Magnesia, on the Maiander, further to the south. I.e. Roman, Latin and Italian cavalry. The future King Antiochos IV Epiphanes (175-164 BCE). His original name was, by the way, Mithridates. His older brother Antiochos had died in 193 BCE.